No previous experience required and you don't even need to be able to swim! Boracay isn't just home to some of the most famous beaches in the Philippines. It's also one of the best scuba diving spots in the country. A diving experience here will allow you to get a glimpse of the rich biodiversity thriving under the beautiful blue waters. This spectacular scuba diving adventure, you won't even need to know how to swim; under the guidance of a PADI certified dive master, beginners will be able to take part in the underwater adventure. You have the option of going in the morning or the afternoon. 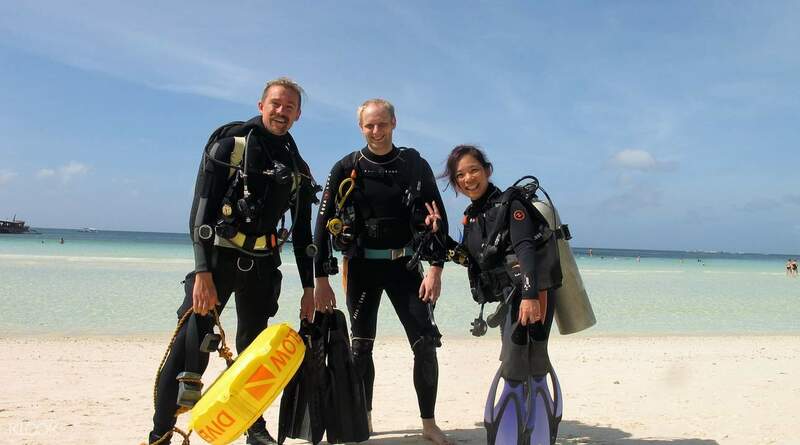 Throughout the experience, a PADI-certified master diver will teach you everything you need to know about your gear and scuba diving, ensuring that even beginners can follow along. You start with a scuba diving video instruction before you get a more in depth lecture and presentation, with various media to guide you. You won't dive in right away, though! You start in shallow water so you can practice those skills. And once you're ready, it's time to go out on a boat and explore the gorgeous coral reefs and richly diverse underwater ecosystems under the water. 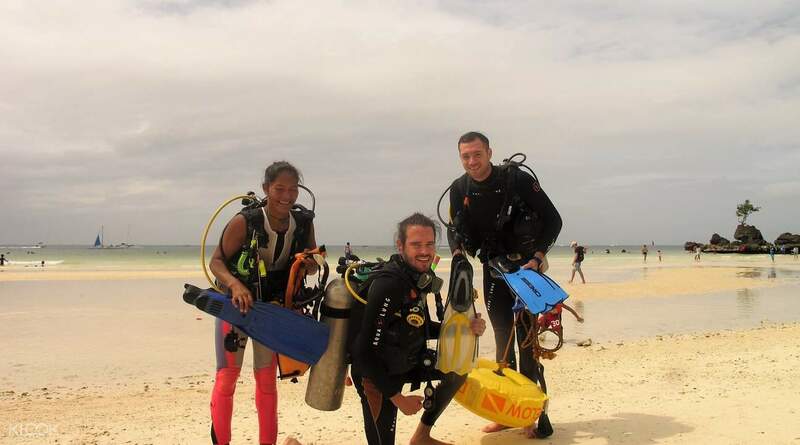 This is an amazing opportunity not just to learn how to scuba dive, but also to have a truly safe and remarkable experience in the waters of Boracay. Had a really great time trying out scuba diving for the first time! I was a bit anxious because I cannot swim, but there's a practice session in shallow waters and the dive masters Josh and Rene were very patient and took care of everyone. They explained everything really well and made sure everyone was comfortable before proceeding for the dive. Saw a lot of cool fish and coral at Angol Point! Had a really great time trying out scuba diving for the first time! I was a bit anxious because I cannot swim, but there's a practice session in shallow waters and the dive masters Josh and Rene were very patient and took care of everyone. They explained everything really well and made sure everyone was comfortable before proceeding for the dive. Saw a lot of cool fish and coral at Angol Point! Thus voucher is worth buying. I learned so much and the experience of exploring the underwater is simply breath taking and amazing! Josh, the instructor is very patient with me. He encouraged me to do the skills.. there may be a bit of struggle but it’s all worth it! Thus voucher is worth buying. I learned so much and the experience of exploring the underwater is simply breath taking and amazing! Josh, the instructor is very patient with me. He encouraged me to do the skills.. there may be a bit of struggle but it’s all worth it! A very great experience to try out scuba diving. The dive master and the other crews around Watercolors are very friendly. I had so much fun on my birthday morning.. well spent with this activity. A very great experience to try out scuba diving. The dive master and the other crews around Watercolors are very friendly. I had so much fun on my birthday morning.. well spent with this activity. Thank you WaterColors for helping me check off one of my bucket list items. It was an amazing and memorable experience all thanks to the diving instructor Joe! During my dive, were able to explore the ocean at depths up to 11 meters while observing the sea life. I highly recommend visitors of Boracay to definitely take a few hours out of their trip to stop by WaterColors and scuba dive with their amazing instructors. Thank you WaterColors for helping me check off one of my bucket list items. 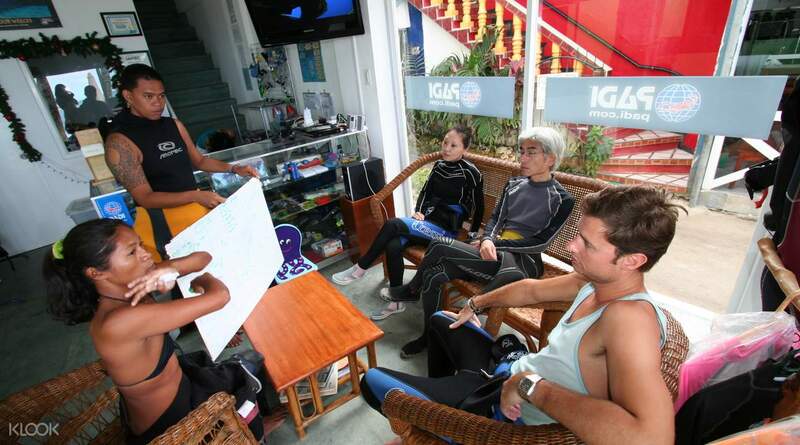 It was an amazing and memorable experience all thanks to the diving instructor Joe! During my dive, were able to explore the ocean at depths up to 11 meters while observing the sea life. I highly recommend visitors of Boracay to definitely take a few hours out of their trip to stop by WaterColors and scuba dive with their amazing instructors. Initially, there was confusion about the location as on at the bottom of our voucher and KLook’s listing, it states Station 1, whereas, our voucher also states Station 3. We went to the one in Station 1, but it turned out to be the one in Station 3. Luckily, the staff at Station 1 helped us call a taxi and we managed to reach the one in Station 3 in time. Other than that, our dive master, Jenny gave very clear instructions and took care of us throughout the dive. Scuba diving was harder than i thought, i had a little struggle at the start in the shallows but it gets so much easier when we went to the open water. It was really fun and we saw many many types of fishes, corals, sea urchins and starfishes. It is definitely worth the experience to at least try it once in your life! Initially, there was confusion about the location as on at the bottom of our voucher and KLook’s listing, it states Station 1, whereas, our voucher also states Station 3. We went to the one in Station 1, but it turned out to be the one in Station 3. Luckily, the staff at Station 1 helped us call a taxi and we managed to reach the one in Station 3 in time. Other than that, our dive master, Jenny gave very clear instructions and took care of us throughout the dive. Scuba diving was harder than i thought, i had a little struggle at the start in the shallows but it gets so much easier when we went to the open water. It was really fun and we saw many many types of fishes, corals, sea urchins and starfishes. It is definitely worth the experience to at least try it once in your life!